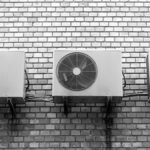 Air conditioning manufacturers have been struggling with a serious problem the last several years; a problem that has left homeowners and small businesses across the country without reliable air conditioning and has led to at least three class-action lawsuits in the United States and Canada. The problem is pitting, corrosion, and eventual failure of copper evaporator coils in residential and light commercial air conditioning units. 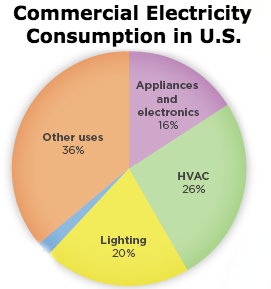 The HVAC industry is changing its processes in response. An air conditioning unit works by moving pressurized refrigerant between an outdoor condenser coil and an indoor evaporator coil. Because evaporator coils are inside a building and protected from the elements, it would seem that evaporator coils would last a lifetime safely hidden away in an attic or closet. But it is precisely because the evaporator coil is sealed away so tightly that coil corrosion is becoming a problem. Evaporator coil corrosion happens frequently because modern construction standards and coil materials are butting heads. Buildings, particularly homes, are being built tighter than ever. Tighter means there is more wall and roof insulation along with better construction standards preventing the infiltration of outside air into the building. From an energy efficiency and utility bill standpoint, this is a good thing. The better a building’s insulation and construction, the less it costs to heat and cool the building. The heat stays out in the summer and the cold stays out in the winter. But keeping air from leaking inside also means that what’s inside stays locked in and this is where the problem with coils occurs. Paints, carpet glue, household cleaners, and solvents all contain chemicals that circulate through the building air conditioning system. When these chemicals, especially those high in chlorides, pass across a copper evaporator coil a chemical reaction takes place on the coil surface. A mix of caustic chemicals and condensate collects on the coil leading to pitting and formicary corrosion. 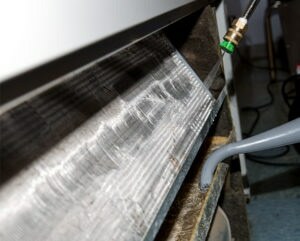 Pitting can be seen on the surface of the coil, but formicary corrosion results in small corrosion tunnels developing below the tube surface that may not be easily visible. These corrosion tunnels creep through the coil wall like ant tunnels eventually reaching the interior pipe surface and allowing refrigerant to leak out. In homes or businesses with a lot of cleaning or painting, particularly new construction, the indoor air is rich with chlorides and even within just a few years of completing construction contractors are reporting evaporator coil failure due to formicary corrosion. A lot of coils are being replaced at great expense to manufacturers and considerable disruption to end users. Some manufacturers are making a change. A 2007 Carrier Corporation publication entitled Indoor Coil Corrosion Industry Research Report discusses the problem of formicary corrosion on evaporator coils not only in Carrier products, but across the entire range of coil manufacturers. Carrier announced they would offer “tin coating the copper hairpins in evaporator coils” because tin is not subject to formicary corrosion. A tin coating is an option on some Carrier units, but not their standard method of coil construction. Trane similarly offered an aluminum evaporator coil option that comes with a 10 year warranty because aluminum, like tin, is not affected by formicary corrosion. The change was good, but copper is still the most common material used in evaporator coils and as long as there are copper coils installed in tightly constructed buildings, there will be formicary corrosion problems. 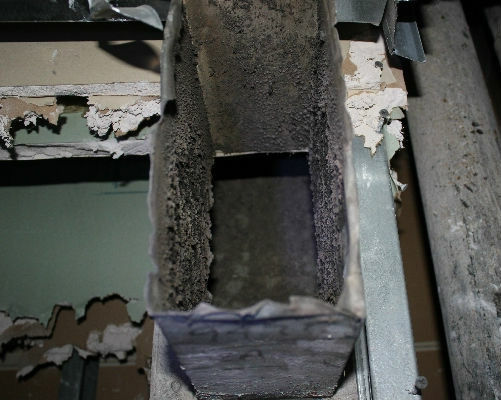 While it is difficult to pinpoint exactly in which houses or buildings evaporator coil corrosion will occur, condenser coil corrosion is easier to predict and prevent. Like most evaporator coils, condenser coils are constructed with copper tubing and aluminum fins. Because a condenser coil is exposed to outside air, equipment installed in areas near salt water, paper mills, factories, or areas with high pollution will degrade more quickly than if the equipment were surrounded by cleaner air. The aluminum fins are particularity susceptible to salt air degradation and after a few years of operation near an ocean, unprotected aluminum fins can literally crumble like old paper. 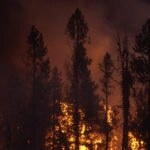 A 2015 US Army Corps of Engineers study on the efficacy of condenser coil coatings on air conditioning units in Hawaii found that salt air corrosion “has reduced expected equipment life cycles by up to 50%.” The report emphasized the need for factory coatings to prolong the life of the coils and fins. The most common protective coating for coils is a baked-on or dipped phenolic coating sometimes referred to as a heresite coating. (Heresite® is an actual brand name, but the term is often used generically in the HVAC industry to describe a corrosion proof coil coating.) This epoxy-like material forms a super thin layer of protection over the fins and tubing to block physical contact between the coil metal and the corrosive air, yet still allow heat transfer. 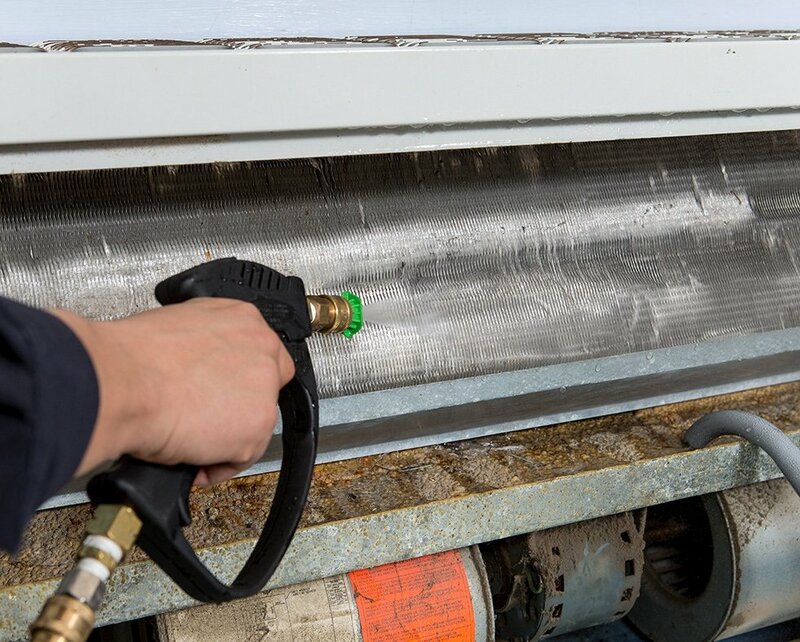 Most manufacturers offer some kind of factory installed condenser coating, but there are also companies that offer field-applied spray-on coatings for owners who purchased equipment without corrosion protection. Between formicary corrosion on evaporator coils and crumbling condenser fins, how can owners keep equipment operating without leaks and coil failure? 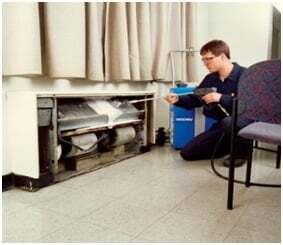 Carrier’s Selection Guide: Environmental Corrosion Protection states it simply that “[r]outine cleaning of coil surfaces is essential to maintain proper operation of the unit.” A reputable and licensed air conditioning contractor can recommend service frequencies and seasonal tune-ups that include evaporator and condenser coil cleaning. If you or your technicians are responsible for air conditioning maintenance in areas where coil failure is a problem, consider washing the coils with non-caustic cleaners that remove residue and dirt, but also do not contribute to coil pitting or corrosion. Goodway’s non-acidic, non-caustic CoilShine® Cleaning Solution with micro bubbles can penetrate deep into coils to get embedded grime from out of the hard to reach areas of the coil. Armed with Goodway’s CoilPro® equipment, maintenance staff and facility managers can wash away salt spray, sand, residuals from acid rain, as well as the chlorides reacting with the copper on evaporator coils. Keeping coils clean seems to be the best treatment against metal corrosion. Goodway’s line of products are there to help your coils last and your equipment run like new.